The return to a trim, taut, terrific tummy following pregnancy. Weight loss or gain is keenly sought by women, wishing to resume their beach, sporting activities and fashion. Abdominoplasty – discussing all procedures to contour the abdomen – to a “trim, taut, terrific tummy” from the front to the back. The problem is excessive loose skin, fatty folds, lack of waist, protrusion due to weakened abdominal muscles, and aged pubis, and may extend around the abdomen from the front to the back, from ribs above to thighs below. Also there may be excessive fat, either from an early age (genetic) or later hormonal deposits being either localised or generalised around abdomen, unable to be removed by dieting. The procedure to be performed is decided after careful assessment of the problems and consideration of the patient’s goals. Liposuction only: Excessive fat in the pubis, front of abdomen, sides, loins and back rolls, with tight elastic skin – no excess, only needs liposuction. Mini abdominoplasty: Where there is an excessive fatty fold handing over a Caesarian scar, this is excised with or without a small amount of liposuction. 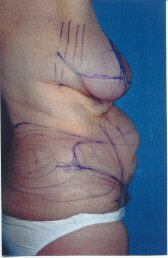 Modified abdominoplasty: to correct muscle distension, loose skin, and fatty collection without moving the umbilicus (no scar). French or American procedure. Full Abdominoplasty: Correction of muscle distension, excision of large amount of excessive skin, liposuction to fat collections. Umbilicus repositioned (scar). French or American procedures. Body Lift: Correction of all loose skin and droop concentrically around the abdomen front to back and from ribs above to knees below. Liposuction of all fatty deposits to 1cm pinch test. Small lipodystrophy (genetic colection of brown fat) concentrically around abdomen from anterior, lateral abdominal wall to loins. Pre Op. Pinch test 3 cms. Post Op. 950 gms of fat removed. Procedure 1 1/2 hours. Pinch test 1 cm, local anaesthetic, day only procedure. Returning to work next day and showering. Large fat collection (4 kg) of fat can be removed circumferentially around the abdomen. With tight elastic skin, non-sun damaged, then the excess of skin will retract to give an excellent result without the need for a full abdominoplasty. 1: Excision and lowering of Caesarian scar. 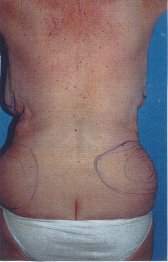 2: Excess of skin lower edge marked and fatty folds to be exised as marked. 3: Liposuction of abdominal wait to umbilicuas as marked 3 cm pinch test reduced to 1 cm. Post Op. Incision line low positioned – flat and taut. Pre Op. Fatty fold overhanding Caesarian scar. Post Op. Smooth curve to abdomen and pubis, ideal for her size and shape. Application very specific and limited to correction of abdominal protrusion due to weakened and separated abdominal muscles following pregnancy. This muscle problem cannot be corrected with exercises. Skin excess is minimal, only in lower abdomen. No scar around umbilicus. Short lower abdominal scar. Most frequently performed with excellent results with the new French (central skin tension) modification producing improved results over the American (Lateral skin tension) technique. All excess of skin over front of abdomen and sides if required. Abdominal protrusion due to weakened and separated muscles. Excessive fat front and sides of abdomen and loins to pinch test 1 to 2 cm, by ultrasonic liposuction. Patient – large and obese around abdomen and loins but not overweight – Metabolic Syndrome. to be 2 cms, loose flabby excess abdominal skin. skin and fat laterally by pinch test 2 cms. Pre. Op. Abdominal protrusion with Exess flat and trim abdomen loin fat. 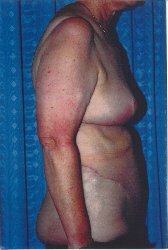 Patient a body builder – excess loose skin and lateral abdomen protruding abdomen. Pre Op. Incisional line placement is shown. Seperated muscles for repair. No loins. Pre Op. Incisional line placement is shown. Seperated muscles for repair. No liposuction. Pre Op. Liposuction to small fat collection in loins. Breast reduction combined with other cosmetic surgery. Abdominoplasty can be combined with other cosmetic procedures, breast, liposuction, facelift. Abdominoplasty. Pre Op. Loose / flabby skin, strae after 3 children, loin flat collection. Post Op. Breasts. Ideal shape, size and projection. Abdomen. Trim, taunt, terrific shape, low scar, shapely loin and back, narrow waist. All surgery leaves a scar. Plastic surgeons are trained to close incisions in a way that usually makes the scars as thin and unnoticeable as possible. Abdominoplasty scars around the abdomen and navel tend to be wider than other incisional scars because of the skin tension in the area. Haematoma (an accumulations of blood around the surgical site that mAy require drainage). If blood loss during surgery has been large, a transfusion may be needed; this is uncommon. A blood clot; if in a leg (deep venous thrombosis), it will require further treatment. Chest infection (more likely to occur in smokers). Nausea (typically from the anaesthetic; usually settles down quickly Specific risks of abdominoplasty. Differences in the symmetry between the right and left side of the abdomen. The navel may have a slightly unusual shape because the skin around it has been removed and tightened with stitches. Some patients report that tiredness and discomfort persist for some months; this is more likely in people who have more complex surgery and general anaesthesia. In some cases, surgery may produce a scar that extends from hip to hip. In patients who have had previous abdominal surgery, the scar from the abdominoplasty may contribute to unsightly scarring. A large abdominoplasty scar may appear to worsen during the first six months of healing. Nine to 12 months of healing are often needed for the scar to become flatter and more normal in colour. If healing has been poor and scarring is unsightly, another procedure may be needed. Swelling may take several months to resolve in some cases. Rarely, swelling and collection of fluid within the abdomen may have to be drained by needle in the surgeon’s rooms. Numbness around the scars in the lower abdominal area and sometimes in the upper thighs. While numbness typically subsides slowly over several months, some minor numbness may be permanent. Circulation may be poor in some areas of the skin around the surgical area. This may lead to a loss of some skin and leave a wound that needs to be dressed until healed (usually two to four weeks.) In such cases, the scar will be worse and may require further surgery. Risk is greatest in smokers. Abdominoplasty scars around the abdomen and navel tend to be wider than other incisional scars because of the skin tension in the area. The size of scar will vary with each patient. Some scars may be unsightly. Temperature higher than 38 degrees C or chills. Redness around the incisions that is spreading. 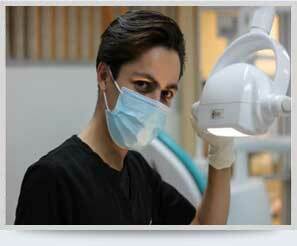 Any concerns you have regarding your surgery.